This simple salad is a summer delight — sweet berries and a peppery cashew dressing combine with greens, carrots, and tomatoes. Recipe and photo contributed by Vasanthi Raghavan, from Mixed and Tossed. Blend all the ingredients together into a paste, adding enough water to get a medium-thick consistency. Add salt to taste and a teaspoon of chopped cilantro. Gently toss the greens, carrots, tomatoes, and blueberries together in a large bowl. Just before serving, pour the dressing over the salad. 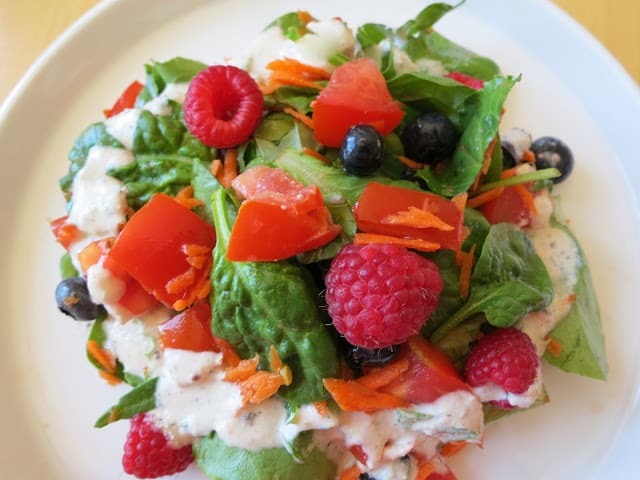 Scatter the raspberries over the salad, but don’t mix in. Vasanthi Raghavan has been documenting healthy and delicious salads and soups that she makes for her family and friends at Mixed and Tossed. Most of her dressings are oil free!